Two times over the course of my visit to Żychlin, my host Henryk told me a story about a young Jewish boy who survived the war and returned to the town to collect his family’s jewels. A bad Pole threatened the boy’s life unless he showed him where the valuables were hidden. The frightened boy showed him. They sat down at a table and for each one item the bad Pole gave the boy, he took several for himself. The boy took out a roll of money and offered to buy the jewelry. Then, the brother of the bad Pole came in and saw what was going on. He told his brother, “Here, I have two bottles of vodka. We’ll drink together.” Then he gave the boy all his money and jewels back. The story made an impression on Henryk. 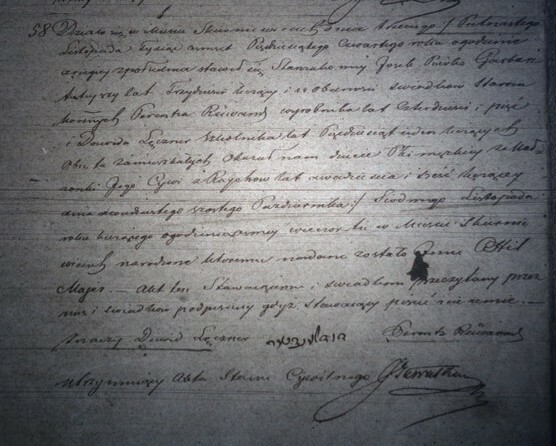 He said a woman from Włocławek had told it to him. Because they were talking on the phone, he didn’t want her to tell him the real names of the men. He wants to save it for when they meet in person. That kind of information is better shared face-to-face. The second time he told me this story, it occurred to me I might know the woman he had spoken with. 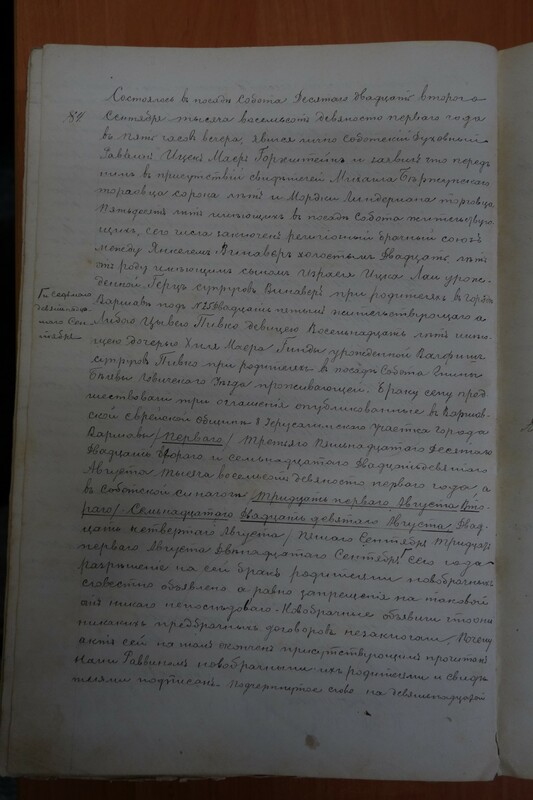 Indeed, it turned out that it was Mirosława Stojak, who has made it her personal quest to learn all she can about Włocławek Jews. Henryk promptly called Mira so we could talk. I met Mira during my first visit to Włocławek in 2014, and then again when I was there in June. “What?” and looked at the table. Ariel ran as fast as his legs would take him. It was a marathon. He didn’t even touch the rock; he didn’t hear the barking dogs. He sped ahead with all the strength in his legs, not looking back. When he got to the station, the train stood ready for departure. Mirka told me she met the boy from the story when he visited Włocławek (now of course, he’s an elderly man). His wife wore some beautiful jewelry; she doesn’t know if these were pieces he recovered, but it is nice to think that they were. At his request, she changed all the names when she wrote down the story. Nor did she write about the further misfortunes the boy experienced before he found his way to safety in Israel. I won’t either—the most important thing is that he survived. 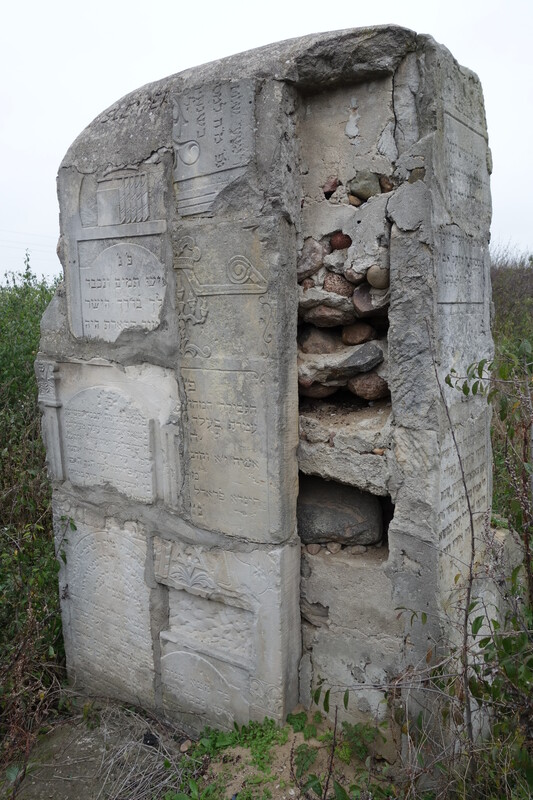 The Jewish cemetery is on a hillside on the outskirts of Żychlin, surrounded by a metal fence. The place is overgrown, though not too long ago someone cleared out some of the underbrush, leaving cut branches in piles. The tombstones were decimated during World War II. The remaining fragments were assembled into roughly formed monuments, which are disturbing for several reasons. For one, there are so few remnants relative to the size of the cemetery. Second, most are just pieces of the original stones. Third, the monuments have a haphazard quality. I wished for something better able to display the details of the remaining tombstones, and more visually compelling. Three such piles (I don’t really know what to call them) are near the entrance gate. 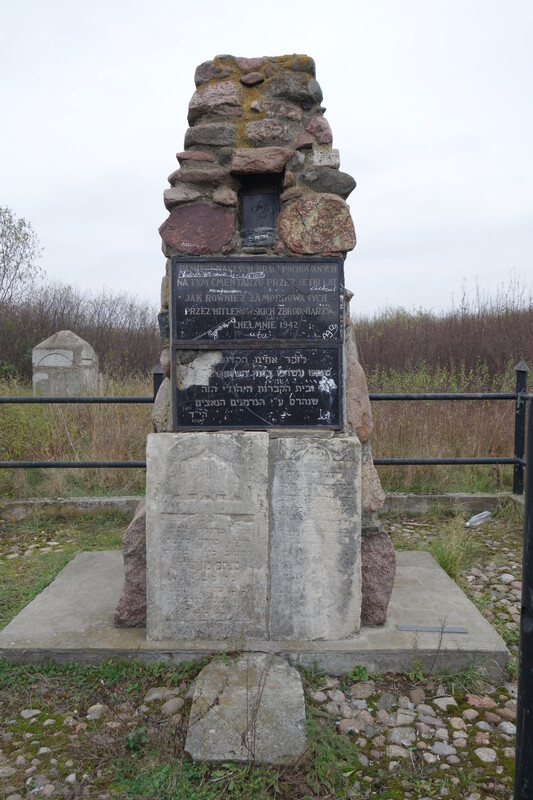 A fourth is behind a monument with the inscription in Polish and Hebrew, “In memory of our brothers buried in this cemetery as well as for those murdered by Hitler’s criminals at Chełm [Concentration Camp] 1942.” The plaques are covered with graffiti—mostly peoples’ names, though “Wisła,” the name of a soccer team, is also inscribed. 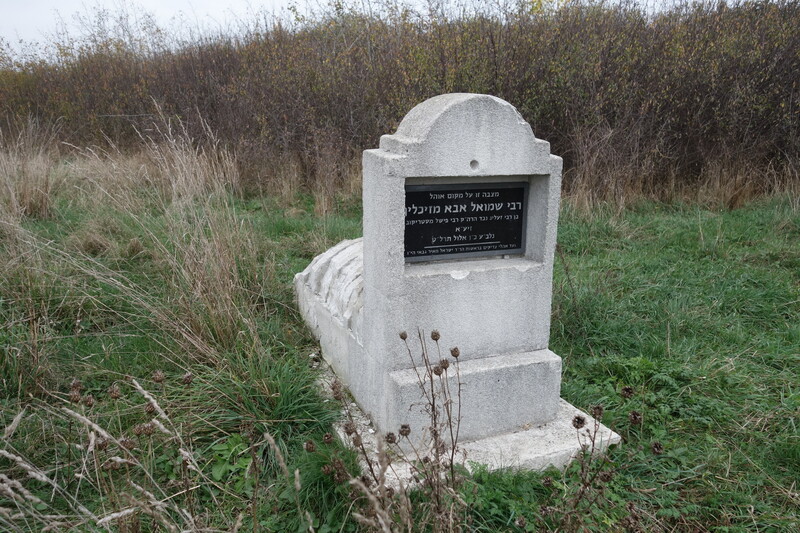 The only grave in what seems like its full form is that of a rabbi. The upright rectangular stone has a plaque inscribed in Hebrew, and domed stones cover the gravesite. No one remembered for sure, but pani Agnieszka said she thinks a foundation paid for the renovation of the cemetery in the early 1990s. Later, pan Józef at the local government offices recalled the work was done during the first term of the postcommunist local government, which would put it about 22 years ago. 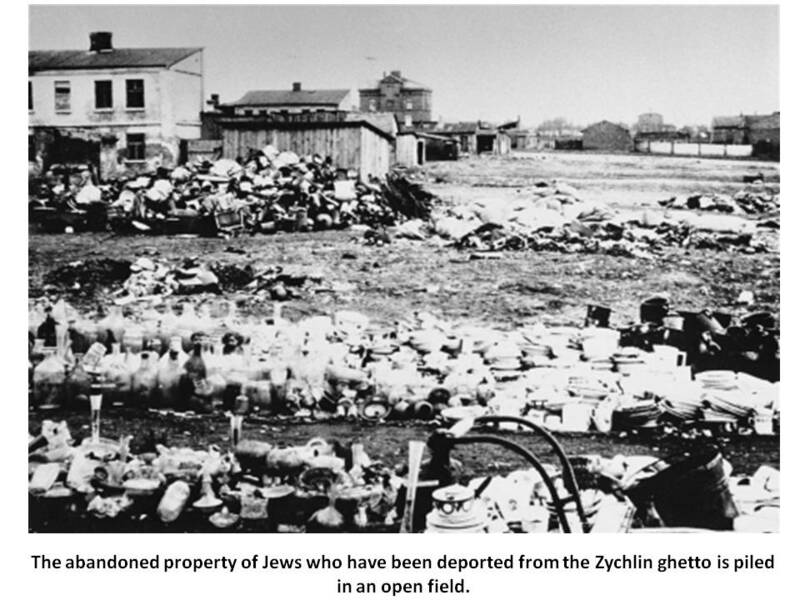 Other events directly associated with the destruction of Jewish life and lives occurred in Żychlin. Nazi occupiers marched 200 Jews to the cemetery and shot them. Pan Józef recalls his father and two other neighbors were awakened by the Nazis and told to dig graves for murdered Jews. There were also two Jewish ghettos in town. The smaller one was on the grounds of an old factory. A long, low workers’ residence (which remains occupied today) was also where Jews lived in the ghetto. The larger ghetto was nearer the center of town. 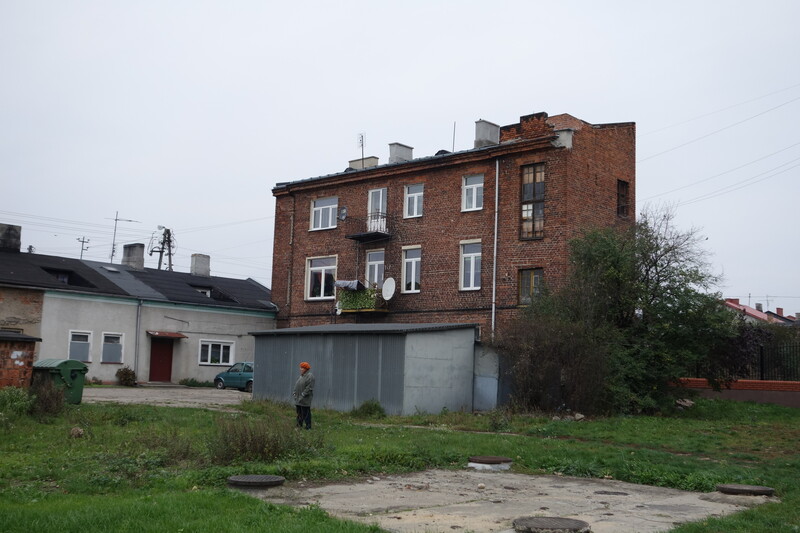 One side of it ran along Budzyńska Street, which was the most common address for Jews in the early 20th century (see Tomasz Kawski, Gminy zydowskie pogranicza Wielkopolski Mazowsza i Pomorza w latach 1918-1942, 2007, pp. 270-77). Pan Henryk explained that the area used to contain smaller, older homes. All the Jews were moved to the area on one side of Budzińska Street, and all the Poles were moved to the area on the other side. Jews were only allowed to walk on the side of street that was in the ghetto. The Jews were removed in 1942 to death camps in other parts of Poland. All the buildings in the ghetto were burned. Pan Henryk gave me a photo of Jews’ possessions stacked in piles in a barren field that had been the ghetto, and a thriving neighborhood before that. In total about 4000 people lived in both ghettos. Most were from Żychlin, though some came from the surrounding area. No one returned after the war. The former ghetto area is now filled with block apartments dating from the 1970s. Some older homes survived along Budzyńska Street. 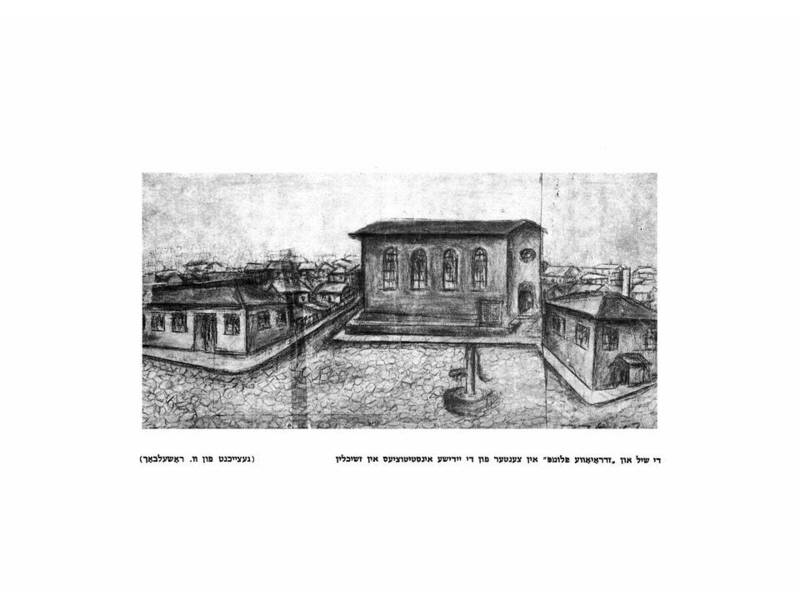 Pani Agnieszka pointed out typical characteristics of Jewish buildings. They tend to be shallow with windows on just the front and sides, and a flat windowless back as if the owners anticipated adding on another home that would share the back wall. She pointed out one house where after the war bedding and other valuables were found above a false ceiling in the attic. There was mention of other places where hidden treasures were found or where former residents returned to dig up the valuables they left behind, but the details were fuzzy. So maybe they really happened, though maybe they are stories built out of the stereotype of rich Jews. 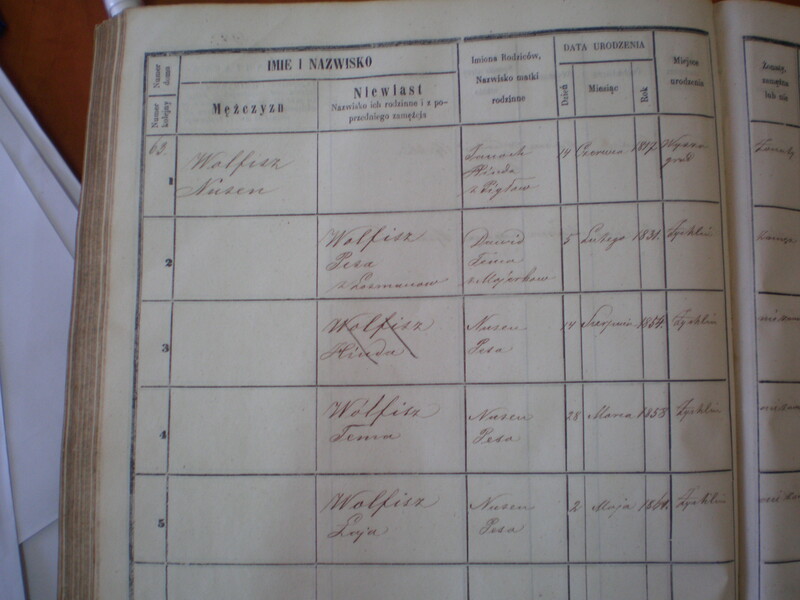 My great-grandmother Hinda Walfisz was born in 1854 in Żychlin, a town near Kutno and perhaps 100km from Warsaw. Before World War II, its Jewish residents (the first of whom settled in the 16th century) comprised as much as 60% of the population. None returned after the war. Many were shot by the Nazis; others were moved into ghettos and then to the death camps. 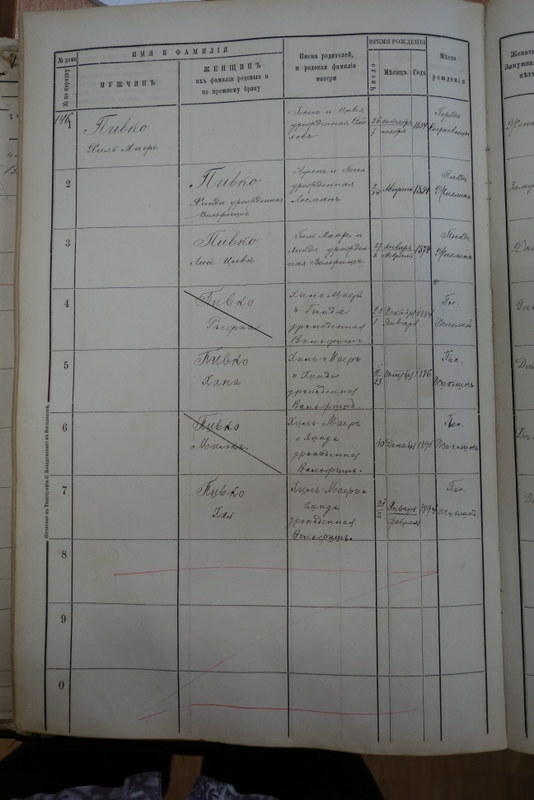 Today, Żychlin has about 10,000 residents, including descendents of prewar Catholic families and others who migrated to the town after the war. My guides where local historians Henryk and Agnieszka Olszynski. Pan Henryk emphasized to me that local history is his passion, but that he is an amateur (his word). 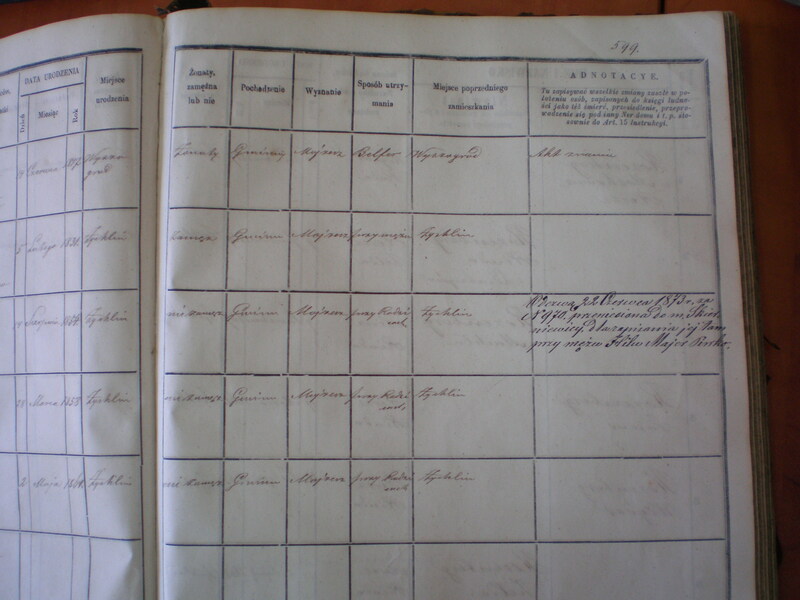 I found him through his blog http://zychlin-historia.com.pl/ in which he documents his ongoing discovery of historical information about the town. 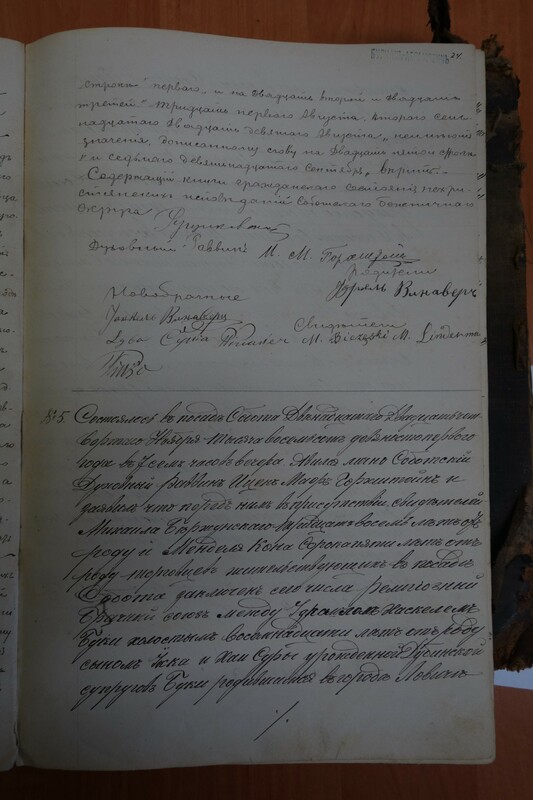 Henryk’s wife Agnieszka said she couldn’t avoid becoming interested in history through her husband. 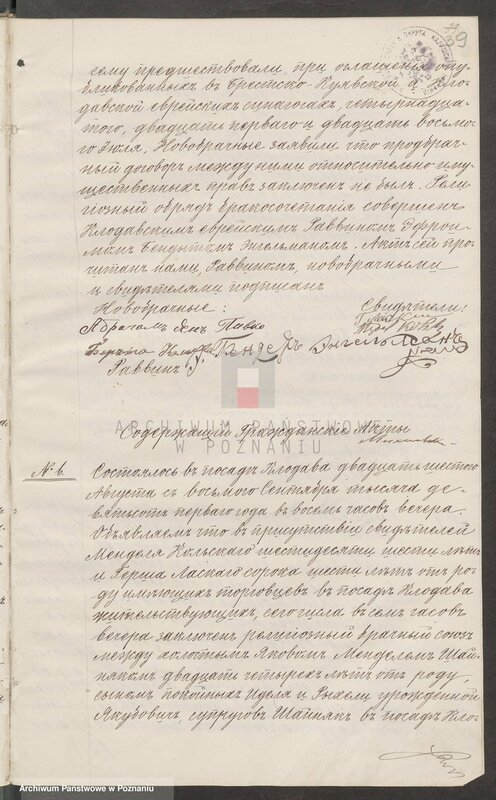 She took the lead when describing the places we visited, while pan Henryk talked more about the supporting documents he has found through the people he has met, in Polish archives, and online. From the very beginning, pan Henryk stressed to me that Jews and Christians lived well together. 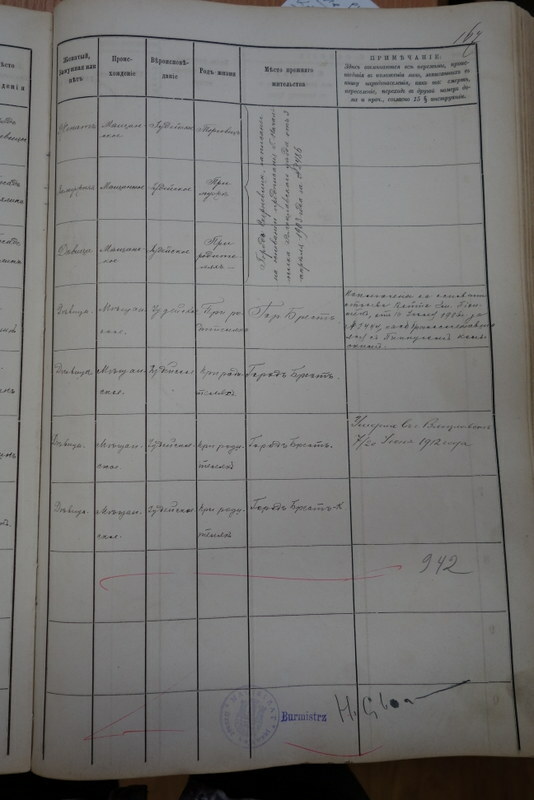 There were no pogroms in Żychlin. He drove us through former Jewish neighborhoods to the synagogue, Jewish cemetery, and World War II ghettos. 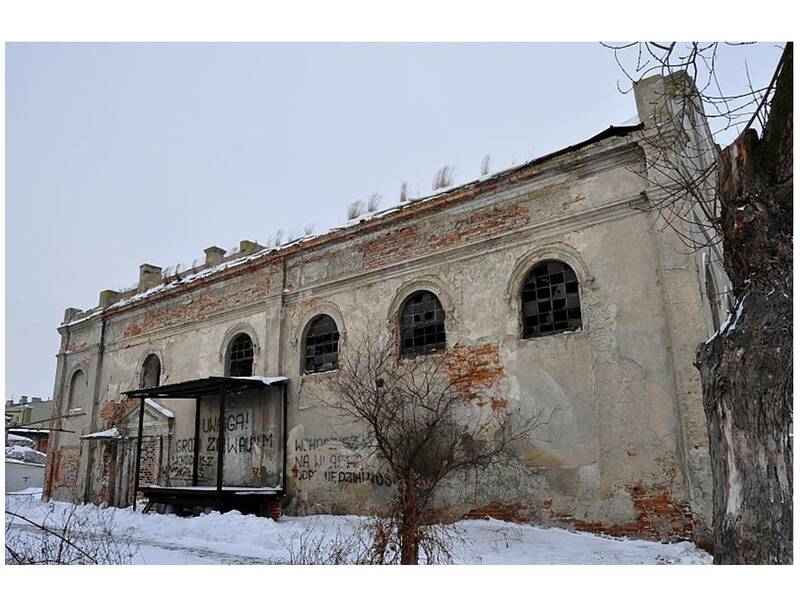 The synagogue is in a neglected part of town, surrounded on two sides by the backs of buildings. The roads here have not been resurfaced in a long time. They have ruts and holes, and one paved with rounded stones probably dates back a hundred years. 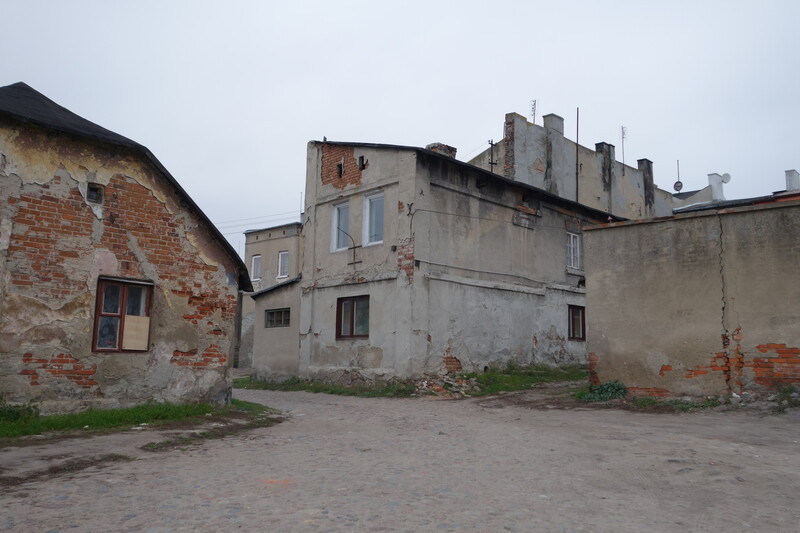 Pani Agnieszka explained that all the buildings around there used to be owned and occupied by Jews. Now they belong to the town and are rented. It doesn’t look like anyone bothers to maintain them. For instance, the wall of one house has a wide crack, windows are old, and plaster is falling off walls. Residents looked out at us from behind curtains and doorways. 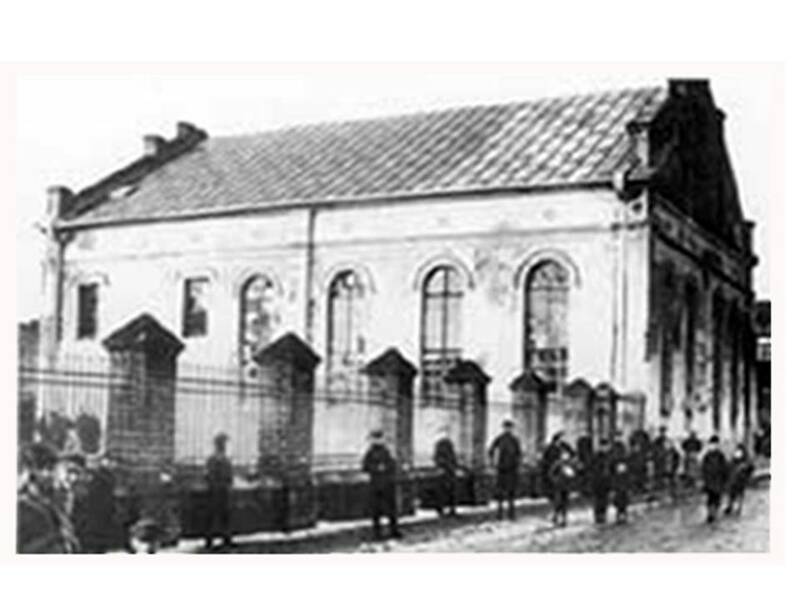 The synagogue was used by the Nazis as a warehouse. They bricked up all but the tops of the long arched windows. For many years after the war, a state cooperative continued to use the building as a warehouse, but now it stands abandoned. The roof fell in five or six years ago. Pan Henryk said one day there was a loud crash as it just collapsed. Until recently, the wooden babiniec (2nd floor where women sat) was still held up by metal beams, and the wall paintings were still intact in places. But only a few fragments of paint survive today, barely visible through the gaps where the windows used to be. The salvageable metal and wood were carted away. “You know how it is,” pan Henryk explained. The fate of the remaining walls is uncertain. 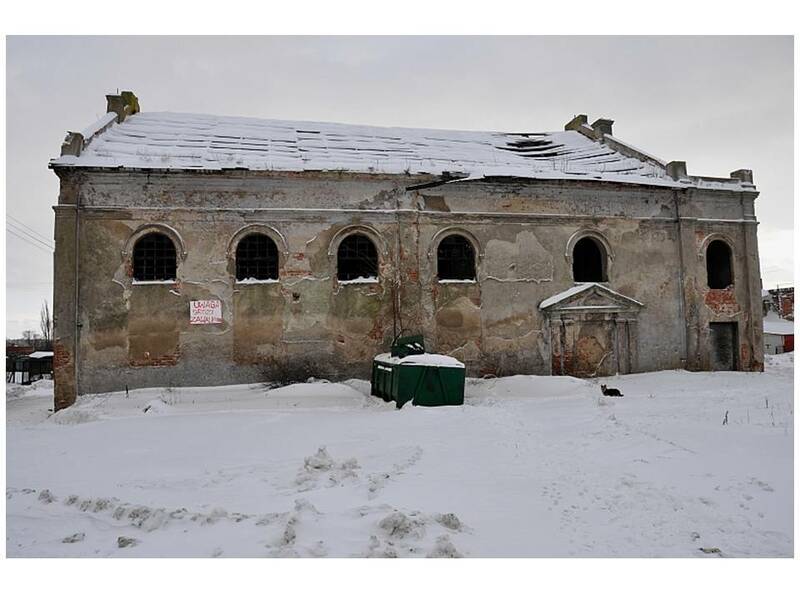 Pan Henryk says the Jewish Community gave it to the local government after the roof fell in, but they have no money to renovate it, nor can they tear it down because it’s protected as a historic site. For now, it seems fated to continue to deteriorate along with the homes and roads around it.